Ending 2013 at 15.6 million units, the industry continues to chase that 16 million-unit sales mark — a level most analysts believe will signal the industry’s full recovery from the Great Recession. And based on third-quarter data, finance sources did their part to put the industry in position to reach that goal, but they may be pushing things a little too far. With the 2008-2009 credit crisis continuing to fade into the distance, the auto finance industry welcomed car buyers in the third quarter with record-low interest rates and record-high advances. Unfortunately, those two metrics were also in line with levels not seen since before the credit markets crashed. 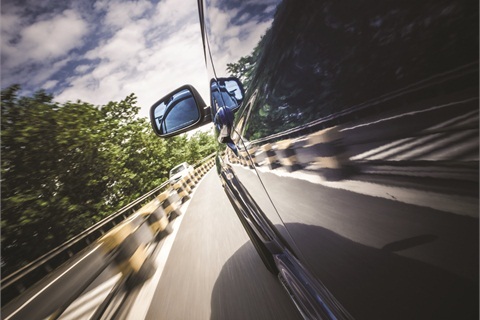 Overall loan balances also reached record highs in the third quarter, but car buyers continued to offset the risk finance sources took by repaying their loans on time — one of the reasons auto finance sources continued to relax their guidelines. But the data also revealed that lender appetite for risk hasn’t fully reached prerecession levels, with subprime financing growing at a moderate pace and average credit scores showing marginal decreases. Here’s a look at the key factors in the third quarter and what they could mean to the industry going forward. Outstanding automotive loan balances reached a record high in the third quarter, increasing from the year-ago period by $103 million to $782.9 billion. That’s a level Experian Automotive hasn’t recorded since outstanding balances reached $713.8 billion in the third quarter 2007 — the same year Experian Automotive began tracking the data. Looking at outstanding balances by state, California (up 29.3%), Texas (up 26.3%) and Nevada (up 26.0%) showed the fastest growth by percentage. Hawaii (up 12.4%), Wyoming (up 12.3%) and Michigan (up 6.8%) were the states with the slowest growth rates. 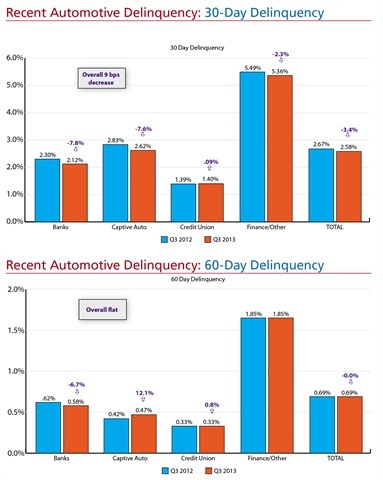 Looking at consumer repayment trends, the 30-day delinquency rate for automotive loans dropped from 2.67% in the third quarter 2012 to 2.58%, while the 60-day delinquency rate remained flat at 0.69%. Both percentages are significantly lower than what was seen in the third quarter 2009, when 30-day delinquencies reached 3.27% and 60-day delinquencies reached 0.90% — the latter putting more than $6 billion in outstanding balances at risk. States with the steepest decline in 30-day delinquencies included Louisiana (down 37 basis points), Nevada (down 33 basis points) and Hawaii (down 31 basis points). The states with the biggest jump in 30-day delinquencies were Rhode Island (up 41 basis points), West Virginia (up 22 basis points) and Wyoming (up 21 basis points). One of the few dark clouds in the third quarter was the sharp increase in vehicle repossessions. In the year-ago quarter, the repossession rate stood at 0.40%. In the third quarter 2013, the rate jumped to 0.62%. However, the increase was limited entirely to finance companies, which typically serve the subprime market. That segment’s repossession rate jumped from 1.18% in the third quarter 2012 to 2.66%. Repossession rates for all other lender types dropped slightly, with the rate for captives falling from 0.39% in the third quarter 2012 to 0.34%. The repossession rate for banks dropped from 0.25% in the year-ago period to 0.23%, while the rate for credit unions dropped from 0.16% to 0.15%. Interest rates also set a new mark in the third quarter, with the average rate dropping to 4.27% — the lowest level since Experian Automotive began tracking auto loan rates in 2008. And car buyers took advantage by taking out larger auto loans, with the average amount financed for new vehicles reaching its highest point since 2008 at $26,719, up from $25,963 in the year-ago period. The drop in interest rates and the slight stretching of payment terms — which increased from 64 months in the year-ago period to 65 months — helped keep monthly payments relatively flat for car buyers. The average monthly payment on new vehicles during the quarter increased $6 from the year-ago period to $458. The average monthly lease payment also dropped in the third quarter, falling from $409 in the year-ago period to $404. The transaction type also continued to increase its share, accounting for 27.22% of all new-vehicle financing. That’s up from 24.4% in the third quarter 2012 but down slightly from the second quarter 2013. That’s when the transaction type reached an all-time high at 27.64%. 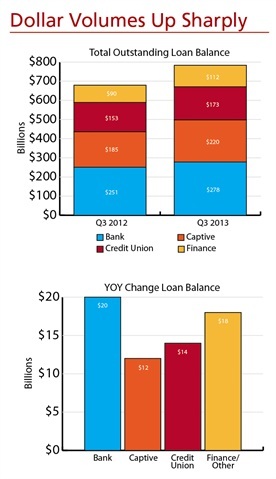 One area that showed some slowing was the growth in loans made to customers with below-prime credit. 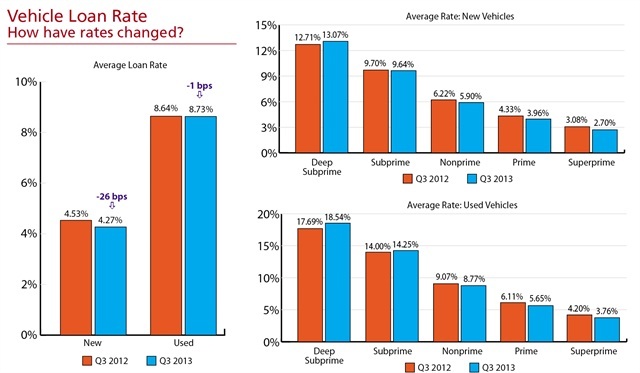 In the third quarter, the share of nonprime, subprime and deep-subprime new-vehicle loans rose slightly from 24.84% in the third quarter 2012 to 26.04%. For used vehicles, below-prime loans accounted for 54.95% of the market, up slightly from 54.43% in the year-ago period. Also illustrating that lenders remain relatively cautious was the slight drop in average credit scores. For new vehicles, scores fell slightly from 755 to 753. For used-vehicle loans, average credit scores remained flat vs. a year ago at 668. But both scores remained above prerecession levels, including the 749 and 663 scores recorded for new- and used-vehicle loans in the third quarter 2007. The threat of another credit crisis still looms large over the auto finance industry. That means finance sources need to keep their eye on the one metric that guides their appetite for risk: delinquencies. As long as consumers keep making payments on time, the industry’s risk tolerance will remain relatively high. If delinquencies begin to rise, however, the industry will need to make some quick adjustments. But since current lending strategies show finance sources are only taking moderate risks, any short-term adjustments may only be a small bump on the industry’s drive to recovery. The share of new-vehicle loans made to below-prime customers rose 4.8% from the year-ago quarter. The average credit score for new-vehicle loans dropped two points from a year ago, while scores for used-vehicle loans remained relatively flat. 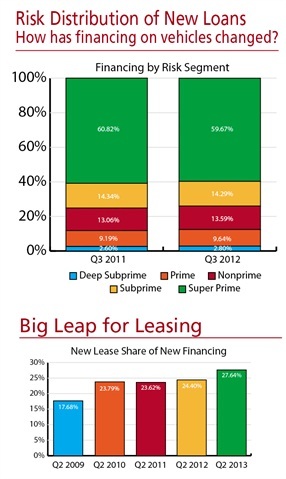 Leasing accounted for 27.22% of all new vehicles financed in the first quarter. The average new- and used-vehicle loan rate dropped 26 basis points and 1 basis point to 4.27% and 8.63%, respectively. Melinda Zabritski serves as director of automotive credit for Experian Automotive. E-mail her at [email protected].